THIS ONE IS FOR THE KIDS: Aboitiz Foundation Project Dev’t. Officer Mr. Danny Cerence and Cotabato Light team facilitate the turnover of AGAPP building to CCCPS pupils, teachers, parents through their principal Mr. Wahabi L. Guiani with DepEd officials as witnesses. Our leaders of today believe that one of the solutions to our long term problem on poverty, unemployment and economic advancement is through our educational system. Thus, we have now the K+12 program of Department of Education. But, unfortunately with this good program comes the “educational gap” – more classrooms and trainings for teachers are needed. To help address the gap, the AGAPP (Aklat, Gabay, Aruga tungo sa Pag-angat at Pag-asa) Foundation and Aboitiz Foundation Inc. merge forces and resources to help the pre-school children by providing 1 storey- 2 classroom building nationwide. Aboitiz Foundation Inc. pledged to donate 45 Silid Pangarap buildings to AGAPP Foundation in two years. For 2011, 26 buildings will be turned-over, one of which was done on September 30 in Cotabato City. 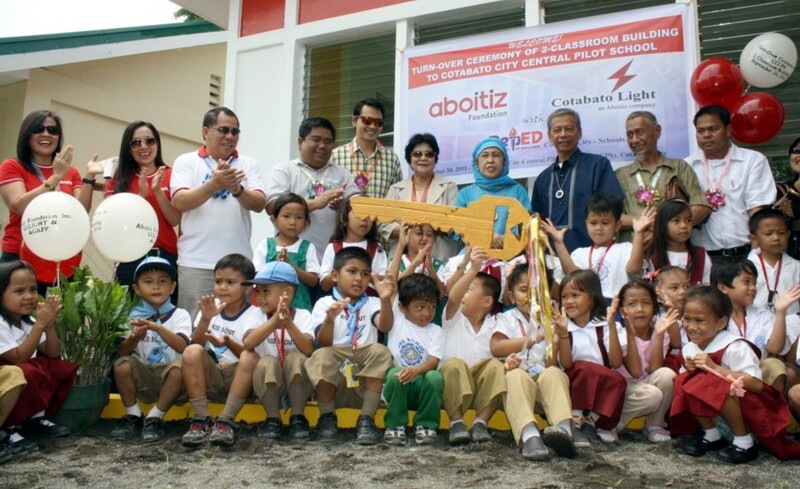 Cotabato Light, an Aboitiz company, facilitated the construction and selected Cotabato City Central Pilot School (CCCPS) as the recipient school basing from their volume of students and number of enrollees. “Wala ng hihigit pa sa tamis ng isang bagay na hindi hiningi, kusang ipinagkaloob at walang inaasahang kapalit mula sa pinagpalang mapagbigay” Mr. Wahabi L. Guiani, CCCPS Principal said. "We would not forget, and forever, we would value every drop of the portion you have expended for our children’s behalf. We can guarantee you that we will take this as a precious gift because it is the product of your untainted intentions” he further added. About 1.1 M has been expended by Aboitiz Foundation Inc. for this project for AGAPP-CCCPS, made by Compact II Gencon, Inc. The sturdy and attractive building was based on same designs of AGAPP nationwide. With complete books, supplies and teacher's training, this project is definitely on its way in making sure that all Grade 1-entrants have the necessary preparations to make them ready for academic work and consequently succeed in formal school. “We at the Aboitiz Group is very happy with this donation. We are glad to be of service to our community. Certainly with the increasing number of pupils this project will be of great use for the welfare and education of the students especially with our pre-schoolers. Kami sa Cotabato Light at AFI ay inyong ka-AGAPP-ay” – Mr. Donjie Vertuoso spoke on behalf of Cotabato Light’s Resident Manager Crisente M. Ferolino.